You’re a lover of live music but your favorite artists don’t play in your area. Maybe there’s not a suitable venue, or your town is a bit off the beaten tour-path. What can you do? One option may be to host them with your own house concert. Whether you’ve done it before, or this is your very first time, we hope the information here comes is useful. You don’t need to own a very large home to make a comfortable and satisfying house concert possible. A house concert is just that, a concert that happens in the comfort of your home, your patio, your clubhouse, your grange hall. Hopefully you won’t have to incur the cost of facility rental, though in some subdivisions a community hall is available at a low cost. You get the benefit of having the performers playing in an intimate, acoustic setting. Whether you can seat 20 or 75 people, it’s possible to make the setting work for all concerned. While some people regularly host house concerts as a series, there’s no reason you can’t host a one-time or occasional event. Part of what makes the event special is that this is both a listening and social event–guests can mingle and chat with each other and the performer at intermission or after the show. Creating a checklist can be very helpful in organizing yourself. It helps answer the question “Do I have time to do what it takes for a successful concert?” and serves as a reminder for building buzz for the show. 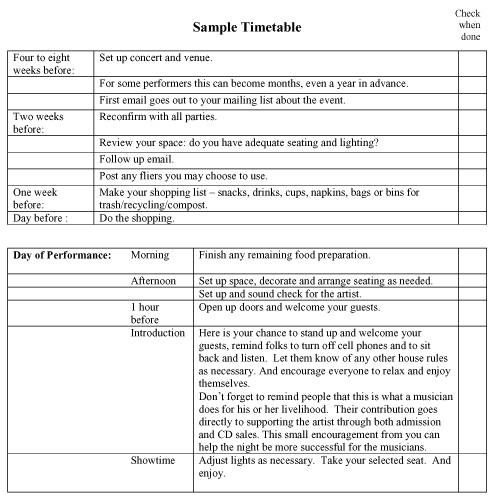 See a sample checklist with timetable at the end of this article. Your venue: Before agreeing to host a house concert, be sure you have a viable performance/listening space. If you can comfortably fit twenty people in front of a performer, you are set with your venue–most people find they can accommodate considerably more with creative furniture moving, additional chairs and/or cushions. If not, check with your friends or look for that simple, small space close to your home. A clubhouse, community center or grange hall can make your event a community affair. Your Performer: Perhaps you have a friend who is a musician and needs a place to play. Or a member of your favorite group is coming through town and needs a gig. Maybe you saw a listing from an artist trying to fill a date while travelling to other performances. Possibly, the artist sent out a note on her mailing list asking for help filling a date. The idea lightbulb can come on any number of ways. Act. Email the musician and start the dialogue about the visit. Make sure that your venue is available that evening (don’t do it when your partner has knitting or book group in your home that night!) and that the date works for the performer. Then let the artist know what you envision – for instance, one long set or two shorter ones with an intermission; beginning at 7 pm, for thirty people, with time for Q and A or mingling afterwards. Will you be able to accommodate the musician in your home? If so, they need to know if you have pets, don’t allow smoking, or any other things you would like a guest to know. Musicians usually have mailing lists and can let people in the area know about the event, but you should get the word out as well. If you hope to host more concerts, start creating a mailing list just for the series. You should also have an email address you check regularly through which people can request reservations. Don’t worry, you needn’t advertise your address until people have verified they are coming. If you are worried about the space filling, you should accept reservations even if you are taking payment at the door. Set your suggested donation along with the performer. For a smaller space, you probably want to charge $15-$20, but if you can accommodate 75 people $10-$15 may be fine. For some events, a sliding scale may be best with a suggested minimum. It’s friendlier to refer to the cost as ”donation” than ”ticket price”. That language also shows that you aren’t running a business or making a profit. Perhaps you and the artist negotiate your keeping a small percentage if you need to defray the cost of publicity and any refreshments you provide. Send a mailing out to your friends and colleagues to let them know about the show. Create a fun headline, then have more info in the body of the message. Make sure you include a brief bio of the performer and a website link for more info. 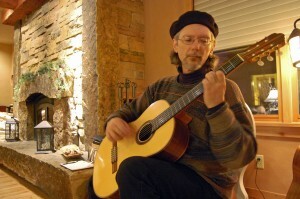 Be sure to include the necessary Who/What/Where/When (for example: Finger-style guitarist Michael DeLalla in a solo acoustic performance, playing for the first time in Bad Axe, Michigan at WhattsamattaU House concerts on 1/1/11). If you have a good community radio station in the area, you may want to put the word out there if you have enough space to accommodate a larger audience. Just use a phone and email address for people to check in to see where the concert is being held. If you have a friendly area record store or coffee shop you may want to place a small poster. Most musicians have a ready to go template if you do not. Again, if you are not comfortable printing your address on the poster, just tell folks where to call to find out more about the event. Get your space set up and ready a few hours before the show. Dedicate a space for drinks or refreshments. Have seating available and set up with good sight lines of the performer. Establish a space where the musician can sell CDs or merchandise and where you accept payment. Do you need a sign to let people know where the restroom is? Is your house or venue easy to find or do you need to add signs or balloons to help show the way? If there are any house rules, you may want a sign or hand-out printed up to assist your audience. Have the performer review the space to see that it is to his or her liking. Most performers are used to doing a setup and soundcheck a few hours before a show. How is the lighting situation? Sometimes a floor lamp near the performer is all it takes to “set the stage.” Maybe you would like to set up some rope lights, buy flowers, or consider any other touches that add a festive atmosphere. If you plan to host more concerts, give your series a name and have a mailing list sign up page for attendees. Just make sure it’s well marked so people know that they are signing up for your email list versus the performer. But most of all, enjoy yourself and the opportunity to keep live music occurring close to home. To download this article as a .pdf, click here. One Response to Host a House Concert!